This pallet of tuna at the Honolulu Fish Auction has been purchased by a buyer for a Hawaii market. When your state is surrounded by the Pacific Ocean, fishing and fisheries management is a big deal. Hundreds of tons of fish move through Hawaii markets every day, so when I received a text message from a close friend of mine, a member of the Western Pacific Regional Fisheries Management Council, who wanted to know if my family and I were interested in touring the Honolulu Fish Auction, I quickly agreed. A boat unloads its catch of tuna across the street from the Honolulu Fish Auction. 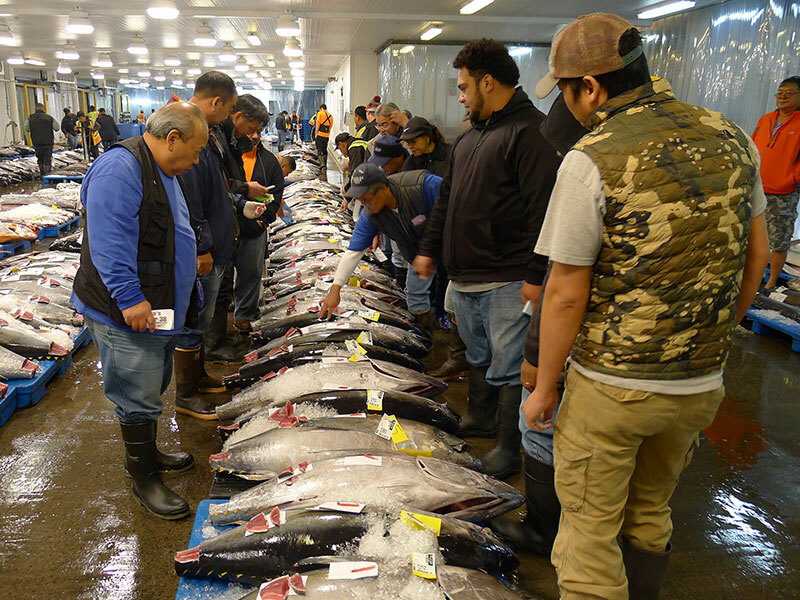 Located at Pier 38 at Honolulu harbor, it is the only fish auction between Maine and Tokyo and the only fresh tuna auction of its kind in the United States. Fishing boats tie up and unload their catch across the street from the auction building--huge bins and pallets filled with fresh catch. We met at the facility in the morning, dressed in heavy coats and footwear because the interior of the auction is chilled to protect the product. You also have to walk through a shallow trough of disinfecting solution to keep bacteria out of the building so flip-flops and sandals are not permitted. Little Girl inspects the day’s catch before the tuna are sold. Small sections of the tuna’s tail has been removed for inspection. Orderly rows of tuna are lined up inside with a small segment of meat near the base of the tail removed and displayed for customers to check for freshness. 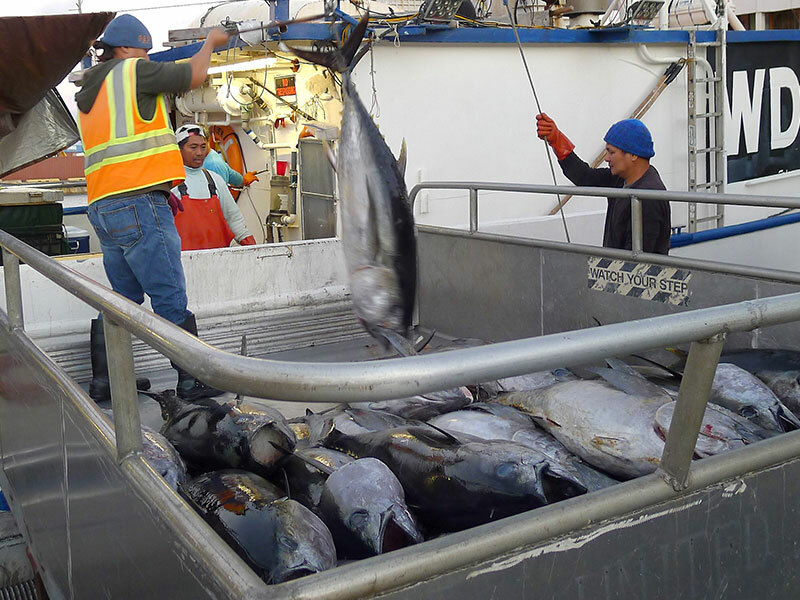 Each tuna displays a date, the name of the boat, weight, and price per pound. There are other species being auctioned--swordfish, mahimahi, deep water snappers and perhaps one of the strangest looking fish, the Opah. 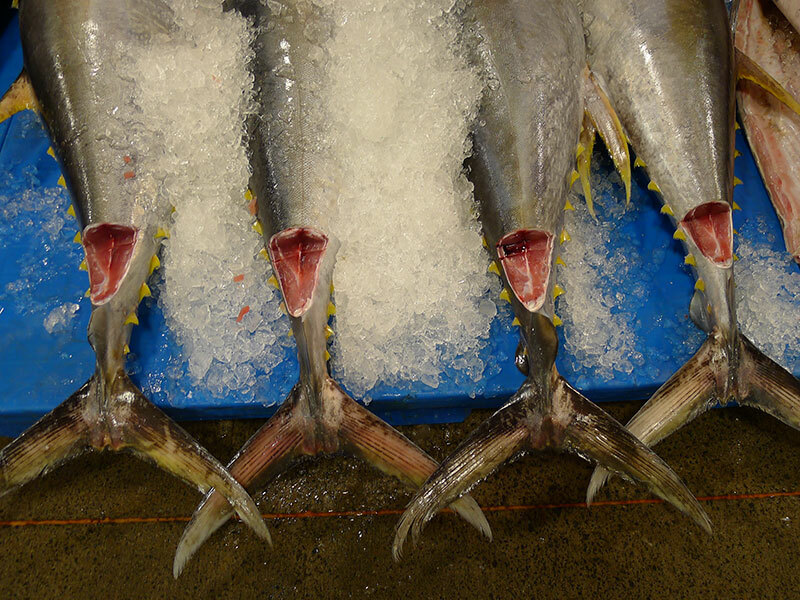 A small section near the tuna’s tail was removed to display the quality of the meat to buyers. Sporting a bright reddish-orange hue and silvery-white polka dots, this fish is rarely caught by the recreational angler possibly due to the depth where it lives. The Opah that make it to the market is often caught accidentally by longline boats fishing for tuna. According to my friend, it was rare to find an Opah at the auction because the boats would often just dump it overboard rather than have it take up valuable tuna real estate in the catch locker. And if it did make it to the market you could often buy the entire fish for just $5. However after people found out how good it tasted, there was no more catch dumping and the price has increased considerably. 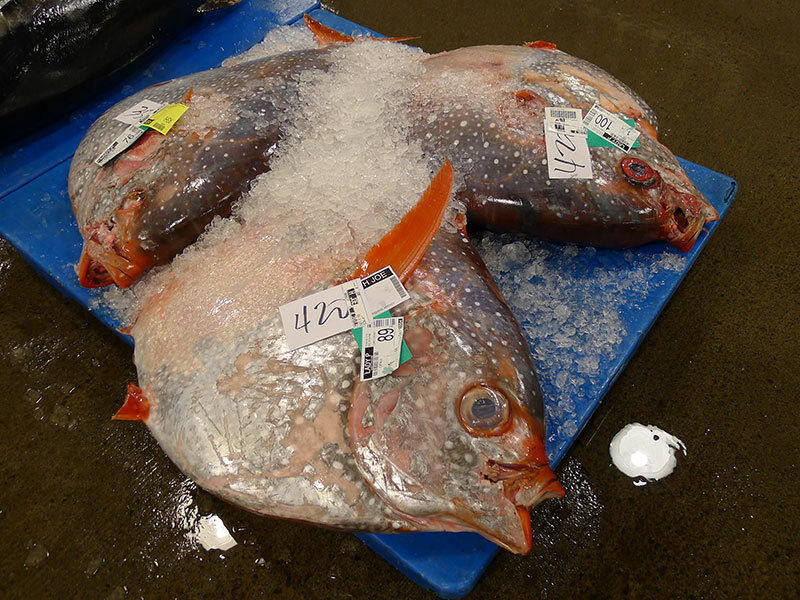 Several Opah are prepared to be moved to a buyer’s truck. The auctioneer, third from right, sells a fish as buyers inspect the quality of the catch. I also learned that anyone can bid on a fish. You can join the big boys, but you better be able to understand whatever the hell that auctioneer is saying and also be able to pay immediately, in cash (no personal check or credit cards), for that 300-500 pound tuna you just bought. Is it economical to do that? You just won a tuna at $5 per pound. If you got a bunch of friends together and everyone kicked in $100, you would have a lot of fresh fish for a large party or luau. 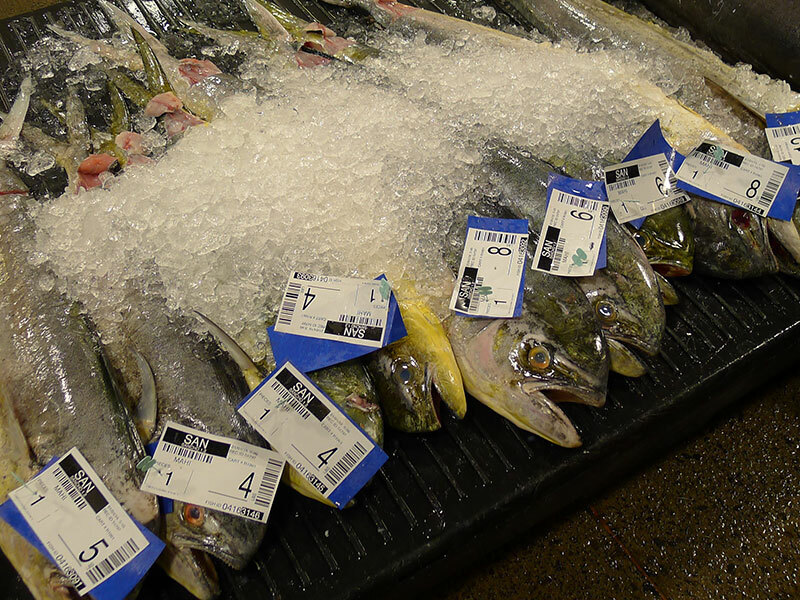 A pallet is filled with a fresh catch of mahimahi. Also being sold that day were swordfish, marlin, wahoo, and snappers. 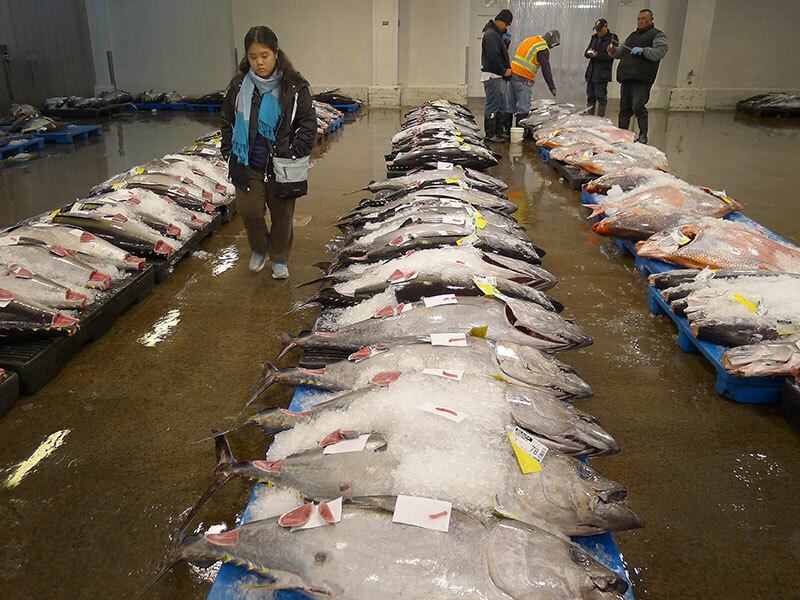 We watched as fish were carted in off the boats, lined up, auctioned off, then carted out to the various markets. The auction begins at 4:30am and ends sometime around 2pm. That’s a lot of fish. 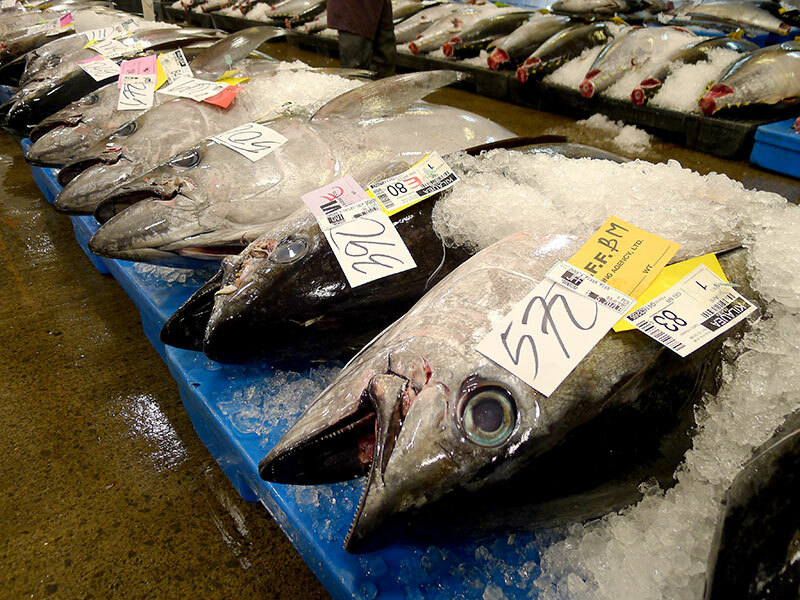 My friend told me Hawaii goes through a lot of tuna every day, needing more tuna than what is currently available, and that overseas imports seen at the markets are there to make up for this shortfall. 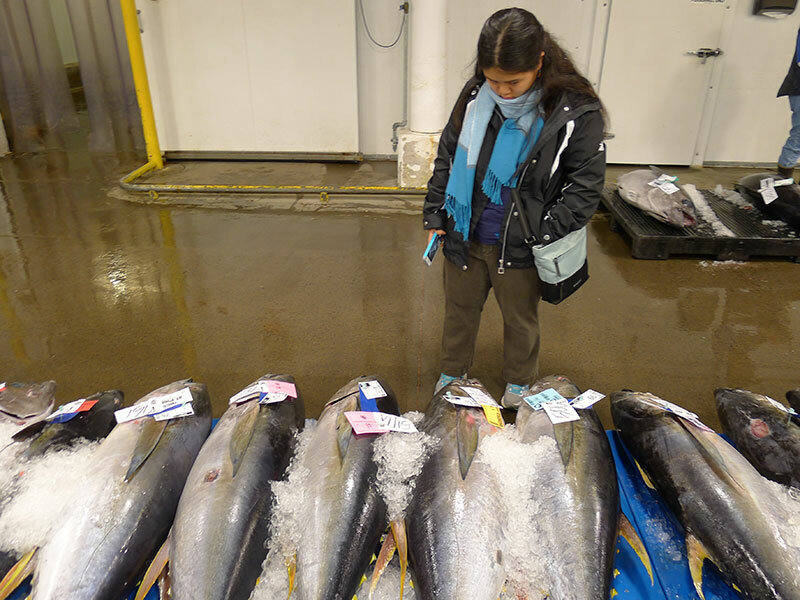 Little Girl checks out the catch of the day at the Honolulu Fish Auction. We left the auction at 9am and headed for Niko’s Pier 38 restaurant for breakfast, just a short walk from the auction. Besides local favorites this eatery also features fresh-caught items boat-to-table. I had the catch of the day served with two eggs, any style, local style fried rice, fresh fruit combo, and coffee. A great way to start the day. DIRECTIONS: The Honolulu Fish Auction is located at Pier 38, Honolulu Harbor, at 1131 N Nimitz Highway, Honolulu, Hi, 96817. EQUIPMENT: This is an active fish auction facility, not a tourist-oriented operation. The building is very cold to keep the catch fresh. I recommend wearing a used pair of tennis shoes or hiking boots (mandatory), old pair of jeans because you will get splashed with water and/or fish blood, a warm sweater and/or insulated windbreaker or fleece jacket, hat or cap, a pair of gloves is optional. 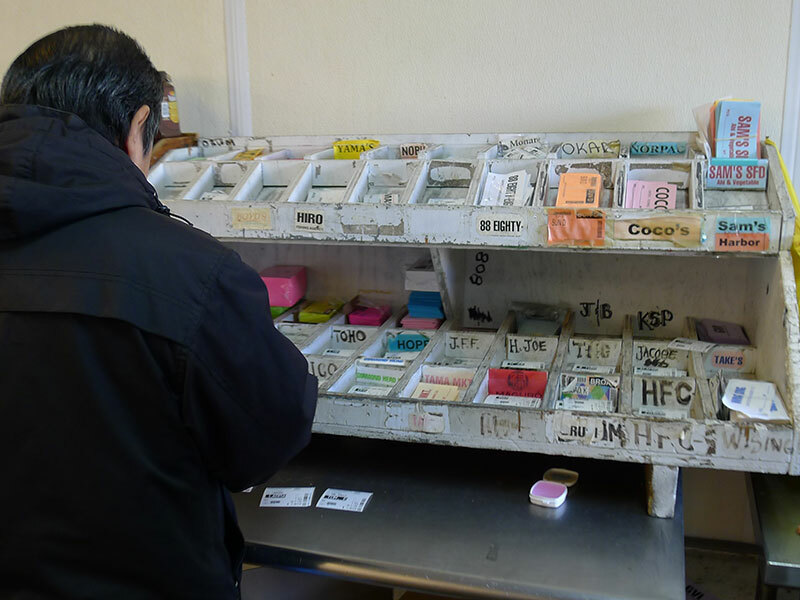 A worker sorts name tags belonging to local buyers.